Cylinder white frost glass set on nickel sconce arms. Includes 6 feet of chain for height adjustments. Fixture attaches to matching decorative ceiling plate and is suitable for vaulted ceilings. Use with (9) Medium, Type A, E-26 - E-27 bulb(s) - 60 watt max. Bulbs sold separately. Deep blackened bronze finish with translucent alabaster glass pairs well with wood and natural colour furniture. 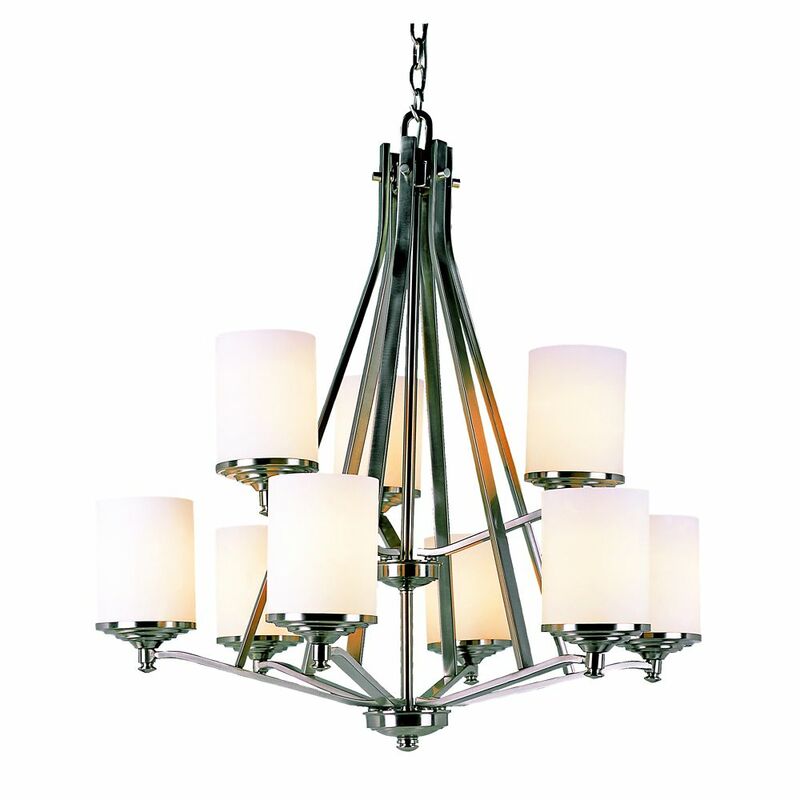 Adjustable height single tier chandelier includes 6 foot chain for height adjustment. Fixture attaches to matching decorative ceiling plate and is suitable for vaulted ceilings. Ranch style indoor fixture pairs well with rustic dicor. Indoor light fixture includes hardware, installation instructions, and 8 foot chain for hanging adjustments. Fixture attaches to matching decorative ceiling plate and is suitable for vaulted ceilings. Transitional curve with angled bell shades create a great new indoor look. Chandelier includes matching hardware, installation instructions, and 8 foot chain for height adjustments. Fixture attaches to matching decorative ceiling plate and is suitable for vaulted ceilings. Quality cut crystal brings sparkling reflections in to room with a dramatic effect. Chandelier includes hardware, installation instructions, and 8 foot chain for height adjustments. Fixture hangs from matching decorative ceiling plate and is suitable for vaulted ceilings. Nickel with Frosted Cylinder 2 Tier Chandelier Cylinder white frost glass set on nickel sconce arms. Includes 6 feet of chain for height adjustments. Fixture attaches to matching decorative ceiling plate and is suitable for vaulted ceilings.